This week marks the start of August and summer break is nearing the end for many college students. With a new school year on the horizon, that means it’s time to get new books for your courses, memorize class schedules, and prepare to watch some college football. As students begin to return to campus, many bass fishing clubs and teams will be holding their first meetings of the year to prepare for the upcoming season. The 2018-19 season promises to be a very intriguing one, and the chase for Cabela’s School of the Year presented by Abu Garcia is already in full swing. Summertime typically presents an opportunity for college students to take a break from the rigors of a long school year and return home to spend time with friends and family. In today’s college fishing landscape however, there are no breaks. The sport has grown to become a year-round endeavor, with tournaments being held across all seasons. 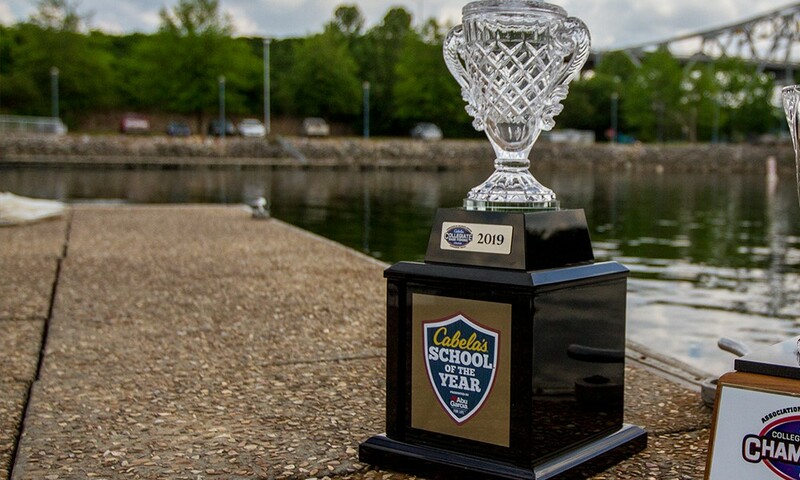 Just as soon as the final fish crossed the scales at the BoatUS Collegiate Bass Fishing Championship presented by Cabela’s, marking the end of the 2017-18 ACA season, the next season-long quest for the Cabela’s School of Year title began the following day. Young anglers departed from Pickwick Lake and Florence, AL to head to their next stop of the tournament season. Over the past few months, a number of major college tournaments haven taken place and one school has taken the early lead by racking up 1,500 points thus far. Adrian College currently sits atop the standings for the Cabela’s School of the Year presented by Abu Garcia. Located in Adrian, Michigan, these northern anglers have competed at a very high level the past several seasons and are looking to break through this year to take home the prestigious title. In this quest to be the nation’s best, Adrian College got off to an early start at the FLW college championship. Nicholas Czajka and Jack Hippe weighed in 30 lbs and 14 oz of Red River bass to finish in 4th place overall at this event. 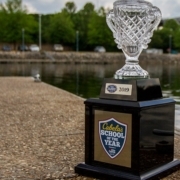 From Louisiana, the college bass fishing spotlight shifted to Lake Tenkiller in northeast Oklahoma for the Bassmaster College Series National Championship. Placing just inside the top 20, marking the team’s lowest finish of the season thus far, Nick Marsh and Jarrod Layton worked a stingy Lake Tenkiller to bring in a total of 14 lbs 1 oz claiming 18th overall. During this same week, fellow teammates Myles Jackman and Zachary Graham stayed up north to fish in a FLW Northern Regional. The pair weighed in 20 lbs and 2 oz to claim 1st place and earn a total of 500 points in the SOY race. With three solid finishes in the books, Adrian College has a total of 1,500 points to start this young season. A popular saying in the sports world is, “Sometimes it’s better to be the hunter rather than the hunted.” One team relishing in this position is Bemidji State University located in northern Minnesota. Fishing a total of three points eligible events this summer, the team has earned 1,435 points. These three quality showings place Bemidji in second place, just 65 points behind Adrian College. The key to a high finish in the Cabela’s School of the Year presented by Abu Garcia is placing well at each and every event during the year. To this point in the season, Bemidji State University has shown a great deal of consistency. Their three finishes this season are as follows: 18th, 6th, and 6th. On the national stage, at Lake Tenkiller for the Bassmaster College Series National Championship, Thor Swanson and Mitch Swanson earned a 6th place finish with 28 lbs 5 oz. Reigning from the “Land of 10,000 Lakes” in Minnesota, Bemidji State is looking poised to remain a strong contender as the season progresses. Another team off to a great start for the 2018-19 season is the defending Cabela’s School of the Year presented by Abu Garcia champion from Bethel University. Winning the title by a historic margin last season, the team from McKenzie, Tennessee is looking to join rare company by being the best team in the country for back to back years. To say that they are off to a hot start this summer would be a definite understatement. The pairing of Cody Huff and Garrett Enders has been the major points earner for the defending champs. Placing well at local weekend, and regional tournaments is a major accomplishment. Consistently contending for titles at national championship events is an even greater challenge. National championship events consist of a selected field of college fishing’s finest who earned the opportunity to fish on that massive stage, the best of the best. At the championships for Bassmaster and FLW college series, Huff & Enders finished 1st and 2nd respectively. These quality finishes earn Bethel a total of 1,380 points overall. Good enough for 3rd place, Bethel University is 120 points out of first place after fishing only two school of the year events. The 2018-19 season is setting up to be one of the most competitive to date. New program changes to the Cabela’s School of the Year presented by Abu Garcia will allow better opportunities for teams to earn more points. With the new school year fast approaching, check the SCHEDULE to see what events are set up for the season. The first ACA event for 2018-19 will be the AFTCO Collegiate Bass Open at Lake Dardanelle in Russellville, Arkansas October 11th-13th. For more details on the updated manner in which Cabela’s School of the Year points are awarded as well as sanctioned events where college anglers can earn points, click here. As more events are scheduled, the Association of Collegiate Anglers will continue to update the listings, so be sure and click back for updates. Complete Standings. The Association of Collegiate Anglers, a division of Careco TV, is a sanctioning body developed to facilitate growth, development, and structure within competitive collegiate bass fishing. The ACA provides support to dozens of school operated regional events nationwide and owns the Cabela’s Collegiate Bass Fishing Series, the largest participatory collegiate tournament circuit in the country. With dedicated collegiate fishing programming on several television networks, three nationally televised collegiate bass fishing events, and thousands of members, the ACA is the leader in competitive collegiate bass fishing. 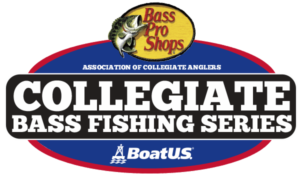 For more information on the ACA, or the Cabela’s Collegiate Bass Fishing series,visit www.CollegiateBassChampionship.com. For more information on CarecoTV,visit www.carecotv.com.